Playing host can be hard work – so leave the prep, mixing and serving to us, while you get your party on! 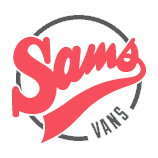 Sam’s Vans are a double act of vintage functionality and retro cool. No, not bespoke skating shoes (which would be awesome by the way!) but two customized VW camper Vans – with a pulse! The mere mention of the word al-fresco and Mojito Steve’s batphone starts to ring. From an engagement to an anniversary, a birthday to a wedding, festival or corporate event it’s an occasion that demands to be celebrated with style, Samstyle! But everyone’s personality, circle of friends, and idea of a good time is going to be different. We therefore work closely with you to create a dynamic and appropriate menu of drinks to provide exactly the right tone, from refined and sophisticated to buzzy and upbeat with the tunes and sound system to match! It wouldn’t be Sam’s unless we offered you the exceptional catering talent we have at our disposal across our three vibrant and individual restaurants…from cold buffets to sizzling BBQ’s and fresh seafood paellas we’ve got more options than you can shake your fluorescent yellow glow-stick at! The wait is finally over after much redesigning and refining we are now open at Crinnis Bay. Sam’s @ The Bay is back for another blissful Cornish Summer. Slightly more central than last year. We open 7 days a week, (weather permitting!) from 10am until late, You’ll see some familiar faces and enjoy a few of Sam’s classics from last summer, as-well-as a few additions we think you’ll love. SO NOT ONLY ARE THE STAFF ALL RESTED AND RECUPERATED AFTER THEIR HOLIDAYS DURING FEBRUARY, EACH RESTAURANT HAS BEEN GIVEN SOME LOVING TENDER CARE. ALL HAVE BEEN UPDATED, RENOVATED AND REFRESHED AND ARE WAITING FOR THE NEW SEASON TO BEGIN FULL ON WITH EASTER THIS MARCH. WE ARE ALL HOPING FOR SOME AMAZING SPRING DAYS AND SUMMER NIGHTS. YOU WILL NEED TO SHOW YOUR CONFIRMATION EMAIL WHEN MAKING PAYMENT. ITS BEEN AN AMAZING YEAR FOR US ALL AT SAMS. THE CITY CELEBRATED THEIR 2ND BIRTHDAY AND THE BEACH HAS BEEN NOMINATED FOR TWO AWARDS. THERE IS SO MUCH ALSO GOING TO HAPPEN IN THE NEXT FEW MONTHS, SO MAKE SURE YOU KEEP ON READING UNTIL THE END. Sam's @ The Bay is Back!